Image caption A blue whale’s head and tail fluke tend to be uniformly grey but their dorsal skin is usually mottled and can be quite pale. The way that whales react to sunlight can shed new light on the human ageing process, say researchers. Some species react by getting darker with UV exposure in the same way as humans get a tan. Others though, protect from themselves from sun burn by turning genes on and off. The work, which is published in the journal Scientific Reports, could lead to new anti-ageing treatments in humans. For several years now, marine biologists in Mexico have noticed an increasing number of whales in the region with blistered skin as a result of exposure to UV light. Over a three-year period researchers took skin samples from three different species of whales during their annual spring migration, when they move to the sunnier waters of the Gulf of California. The scientists found the different species reacted differently to the increase in sunlight. Blue whales are the biggest creatures ever to have lived on Earth, and they respond to the Sun by increasing the amount of pigment in their skin, just like humans. 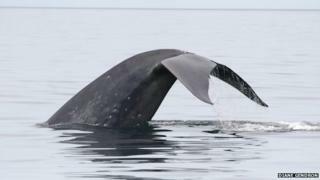 "When blue whales go on their holidays to the Gulf of California they get a tan the same way we do," Prof Mark Birch-Machin from Newcastle University told BBC News. "And that tan protects blue whales from sunburnt DNA." According to Prof Birch-Machin, exposure to ultra violet light can damage not just skin but can harm DNA in mitochondria, the battery packs of cells. The ability of blue whales to tan in response to UV exposure may be connected to their historic migratory patterns as they move annually from higher to lower latitudes with a greater amount of sunlight. Sperm whales have a different approach to the sun, says Prof Birch-Machin. They can spend up to six hours at a time on the surface of the ocean and have far greater exposure to UV light. How do whale species live for 200 years? "They are akin to people going for the lobster approach - so changes in pigment aren't going to help them very much as the UV is overwhelming the system," he said. Instead of changes in their pigment, the sun triggers a stress response in the genes of these whales, which is similar to our own protective mechanism against sun damage. "We saw for the first time evidence of genotoxic pathways being activated in the cells of the whales," said researcher Amy Bowman. "This is similar to the damage response caused by free radicals in human skin which is our protective mechanism against sun damage," she added. The third species the scientists examined were fin whales. These deeply pigmented animals were found to be more resistant to sun damage, with the lowest prevalence of sunburn lesions. The researchers hope that by seeing both changes in pigment and changes in genes, the whales may shed some light on the ageing process in humans. "The sunburnt DNA we find in whales is the same sunburnt DNA we find in humans and that is definitely linked to ageing," said Prof Birch-Machin. "The study shows the interaction of systems that we can then examine further in human research, and that's got implications for anti-ageing and skin cancer approaches," he said. And the research, he believes, will be of interest to pharmaceutical companies. "They are always on the lookout for what they can see in non-human systems and what they can borrow from that in terms of anti-ageing and this research will certainly help in that," he said. The scientists say that further work is required to see if the sun burn that the whales are experiencing turns into skin cancer. They also want to know if an early warning system for the animals can be developed.